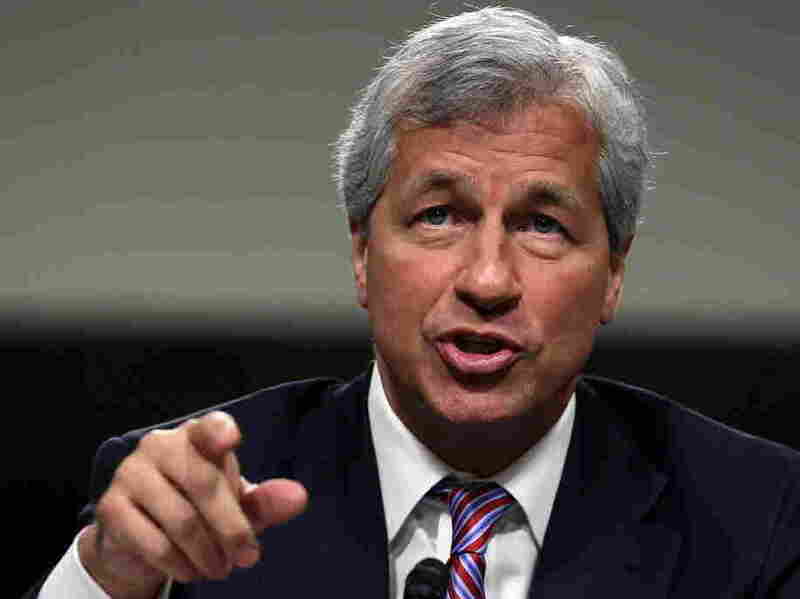 JPMorgan Execs Who Bungled Billions May Have To Return Bonuses, Stock : The Two-Way "It's likely that there will be clawbacks," CEO Jamie Dimon told Congress today, invoking a term that those executives certainly didn't want to hear. JPMorgan Chase CEO Jamie Dimon during his testimony today on Capitol Hill. Translation: The bank will move to recover stocks and bonuses paid to the executives responsible for the losses it suffered because of some risky trades that went very bad. According to The Associated Press, "under bank policy, Dimon said, stock and bonuses can be recovered from executives, even for exercising bad judgment. The policy has never been invoked, he said." Dimon's prepared testimony is posted here. The AP adds that "the start of the hearing was delayed by demonstrators in the room who shouted about stopping foreclosures. Another demonstrator shouted, 'Jamie Dimon's a crook." At least a dozen people were escorted from the hearing room."